The original terminus station in Paisley was at Hamilton Street where the car showroom opposite Halfords is now, but this was replaced by Abercorn station on Renfrew Road when the railway was connected to the Paisley - Glasgow line at Arkleston junction. It ran to Renfrew Wharf at the River Clyde through Sandyford, Renfrew South, Renfrew Porterfield , Renfrew Fulbar Street and King's Inch. 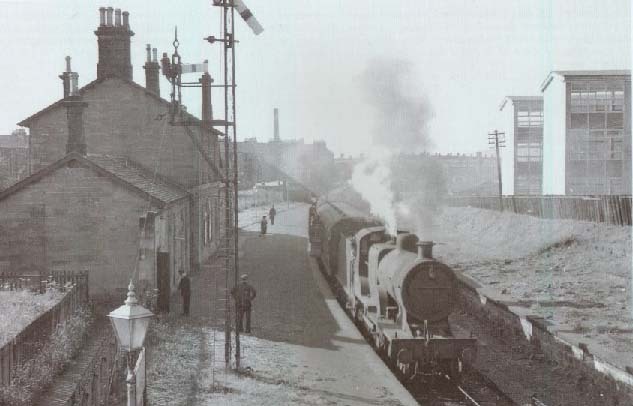 A freight branch led off to the Cart Harbour in Paisley. 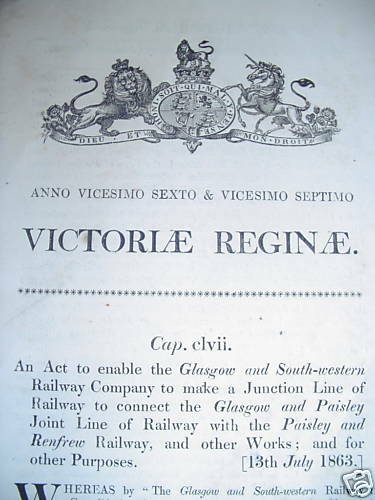 The Paisley and Renfrew railway was was authorized by an 21 July Act of 1835 with an authorized capital of £23,000 to build a 3 mile 60 chain lightly graded railway to the Scottish 4 ft. 6 in. gauge from a terminal in Hamilton Street, Paisley to the neighboring town of Renfrew and to the River Clyde at Renfrew Wharf. The Engineers were Grainger & Miller of Edinburgh. The line opened to traffic on 3 April 1837 (below), using steam locomotives as motive power. In 1842 the locomotives were replaced by horses to save money. The line was bought by the Glasgow, Kilmarnock & Ayr Railway in 1847, which on 28 October 1850 amalgamated with the Glasgow, Dumfries and Carlisle Railway to form the Glasgow and South Western Railway. On 1 January 1866 service was suspended while the line was regauged to 4 ft. 8½in. and doubled. At the same time a junction was made with the Glasgow & Paisley Joint Railway and trains began using Paisley Abercorn in place of the original Hamilton Street terminal. The line began using steam locomotives again as motive power when reopened in May 1866. It closed to passenger traffic under the Beeching Axe on the 5 June 1967, and to goods in 1981. 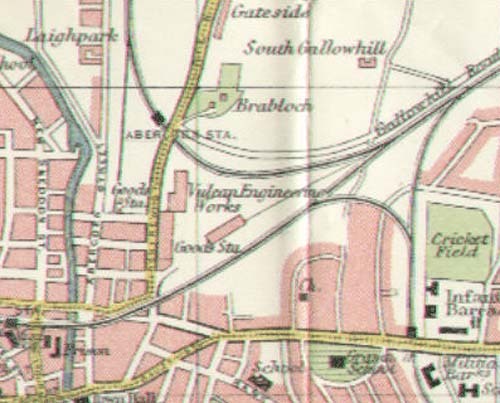 The station is shown in the middle left on an Ordnance Survey map of 1923 below, still with tracks in situ; it is marked as a goods station. The line to Arkleston from Abercorn is also there. 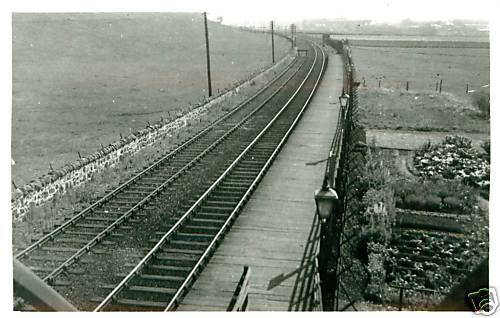 The line was closed to passengers on 5 June 1967 as part of the Beeching cuts and to freight traffic in 1981, with the track being lifted in 1986. 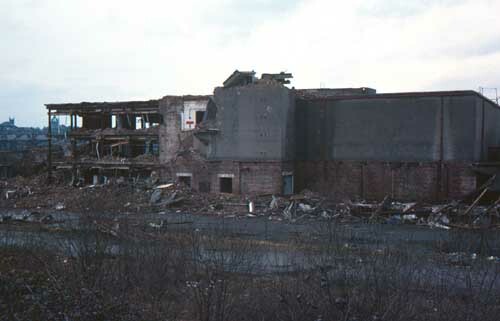 Paisley Abercorn station goods yard was where the Focus DIY shop is now and was demolished in March 1977 (see picture top right below).